← “Sweet Dreams” is the first Novella I have ever read! Again, Steena Holmes is a hit! 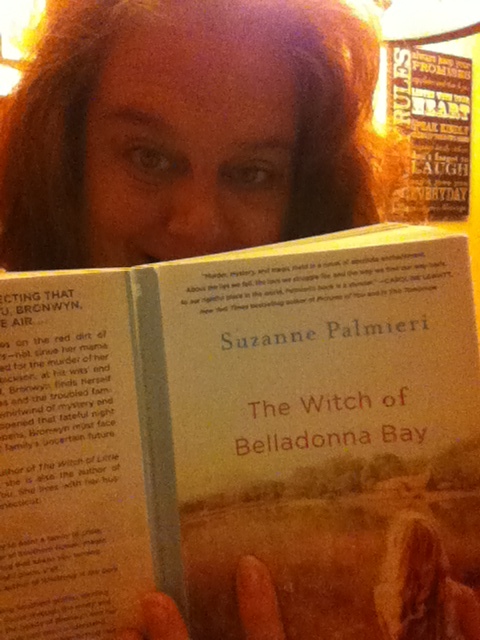 I was utterly enraptured by Suzanne Palmieri’s novel. This story is told with such embraceable Magic, like a pouring out of one’s soul; speaking of things like intuition and “shine” in a rather poetic prose. Byrd would occasionally speak directly to the reader, which was quite original, and made it more intense. Suzanne Palmieri wrote this story in the way a quilt maker tells a story. It was a very different approach to writing, and I devoured every sentence. This is literary genius with a lighter punch (meaning easy to understand….like silk…..”an easily gliding approach to storytelling”). This is a novel that will remain with you, whether it is because of the magic, intuition or beauty within the story. You choose. But, either way; this is a book I recommend for everyone to read. This is a “Just plain fun to read” novel! There are a lot of stand-alone sentences. I loved that!! It will bring out the “dreamer” in you. It would be hard-pressed not to see magic, shine, and glowing in the least expected places, once you put this book down. We are introduced to a wonderful array of characters, Bronwyn “Wyn” and Byrd being the most involved; as every inch of this book comes back to them. Wyn and Byrd both grew up in Magnolia Creek, Alabama. Only Why left to head north when her mother died. She was 17, and truly on the lam; she was running, staying away…and not remembering. Her first stop was Manhattan, where she met her boyfriend Ben, and they moved to upstate NY , together fo r7 years. I was in amazement as to how this relationship unfolds. Wyn was gone for 14 years, missing her Brothers marriage, the birth of her niece, Byrd (now 11), and so many other significant events…..only to return when her best friend, Charlotte is found murdered; and Jamie, Charlotte’s son went missing. Wyn’s brother Patrick (Paddy) confessed to the murders, and was in prison for the crimes. Although no one believed he committed the crimes, he did confess; so in jail….He remained. The things we do for love. Whimsical, smart, ignorant or not, we do them for love. Wyn comes home with the hopes of figuring it all out! She does not believe that her brother could have killed Charlotte, and she was determined to find Jamie’s body (alive or dead). She is going to get her brother out of jail, even if it meant building a case of reasonable doubt. This means letting go of her “Yankee” ways. She has to truly come home…..and, like she states in the novel “She was Southern Belle mixed with Rattlesnake”. She did not lie. Rattlesnake is coming out. There are quotes in this book that are now going on my refrigerator: “Truth is worse than soap in your eyes”, “Family can be such a foul business”, and, “Heaven equals moving air sometimes”. There was a breeze on my face yesterday, and now it will mean something to me more than air just passing by. My loved ones that have gone to heaven are within that breeze!! But, the quotes about Truth and Family most likely hits home for a lot of us, it did for me. Byrd has a penchant for ‘words of the day’, and they were glorious words. This story is almost like living in a dream; a fantastically magical one. I did not want this book to end, and when I had to put it down; I could not wait to return to it. I hate that it ended; but, it was perfection. Beginning to end.